The dwm.exe or Desktop Window Manager is a process in Windows 10, 8 and 7 operating system which helps to manage visual effects such as Flip 3D, Windows Preview, Transparent Windows, High resolution monitor, Transition animation, Live Windows Preview, etc on your Computer. Dwm.exe or Desktop Window Manager consumes memory and CPU resources of your Computer to run its services. It uses hardware acceleration to make nice animations. Today I will show you what is Desktop Window Manager dwm.exe, what are the functions of Dwm.exe, is it a virus or is it safe, why it is consuming too much memory and CPU and how to stop Dwm.exe services in Windows 10, 8 and 7 operating systems. This post is a part of several Windows processes located in Task Manager such as csrss.exe, svchost.exe, taskhost.exe. If you are unaware of these processes then you can read all these posts to know more about it. Desktop Window Manager (Dwm.exe) is responsible for rendering those wonderful graphic effects, Flip 3D effects, transparent windows, high resolution monitor support and live windows preview in Windows 10, 8 and 7 operating system. Is Dwm.exe a Virus or is it Safe? The straight answer to this question is No. In fact it is a process provided by Microsoft in Windows 10, 8 and 7 operating system. It is responsible for providing graphic effects. Hence, Dwn.exe is safe for your system. There is nothing to worry about it. It is not a Virus. It is just a process in your Windows operating system. What to do if Dwm.exe is consuming more CPU or Memory? When it comes to memory and CPU resources consumption by Dwm.exe, it totally depends on your system and your style of usage. Normally Dwm.exe process consumes 50 to 100 MB of memory and 3 to 5% of CPU resources. But if you are a great graphic lover and you like to put 3D themes, screensaver or animations on your pc then Dwm.exe consumes more CPU and memory depending upon the theme you are using. Switching to a basic theme will reduce cpu and memory consumption. It is the best way to reduce load time on your system and reduce battery consumption too. However switching to Basic theme, doesn't stops Dwm.exe from running its services. 1. First you have to open command prompt by clicking Start button and type command in the Search box. 2. After you have typed command in the search box, don't press Enter key and follow step 3. 3. Hold Ctrl + Shift key on your keyboard and hit Enter key. 4. You will be prompted with a message "Do you want to allow the following program to make changes to this Computer?". Just click Yes and the Administrator Command Prompt window will open. 5. In the command prompt window type msdt.exe /id PerformanceDiagnostic and hit the Enter key. 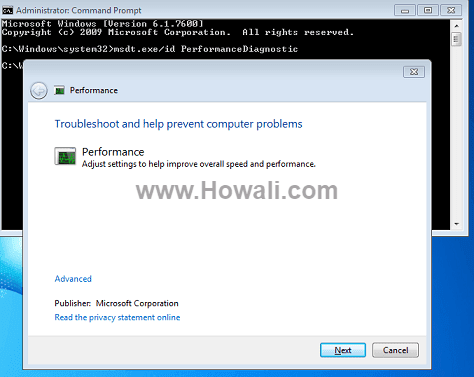 You will get the Performance Diagnostics window as shown below. 6. Just follow the on-screen instructions of the Performance Troubleshooter and this will reduce CPU and memory consumption by Dwm.exe. In most cases updating device drivers works. You can update your display driver, video card drivers, integrated graphics adapter drivers. Updated device drivers helps to reduce load on your CPU and this saves your memory and CPU resources. The real dwm.exe process is located under System32 folder. But if you can see it in another folder also, then it is possible that it's a malware. These types of malware may damage your Windows Desktop Manager dwm.exe file. So scanning your pc with a good anti-malware software helps and removes these types of malware from your pc. So the extra resources which were taken by these malware get free after a full malware scan and this reduces CPU and memory consumption. How to stop Dwm.exe from Services? There is no way to remove Dwm.exe process because it’s an inbuilt exe file which comes with installation of your Windows 10, 8 or 7 operating system. But there is one method by which we can stop Desktop Window Manager (dwm.exe) from rendering its services. 1. First you have to open Run box. 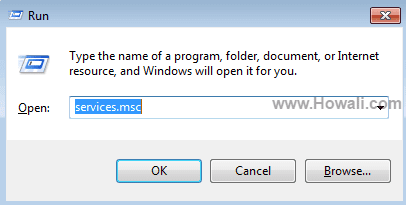 For that you have to press Windows + R keys on your keyboard and type services.msc in it and click OK or press Enter key as shown in the image below. 2. This will open Services window. 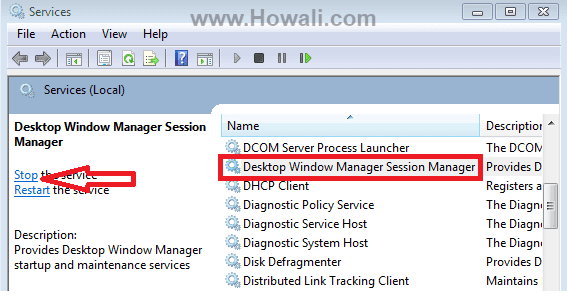 In the right pane of the Services window, scroll down and locate Desktop Window Manager Session Manager as shown below in the image. 3. In the left pane of the window click Stop the service. Once you have clicked Stop, this will stop the Desktop Window Manager (Dwm.exe) service on your computer. Same way you can Start this service whenever you want. And this time you will have to click Start option. You will see the Start option only when you have Stop the services. Do let me know how this post has helped in learning more about Desktop Window Manager or Dwm.exe. Don’t forget to subscribe to my email list for more helpful tips. If you like this post then do give us a +1 and a Facebook like below. Do share this post with your friends from the social network buttons below.